Bombay House, the heritage building owned by Tata Group, recently went under renovation and has emerged as Bombay House 2.0. Anyone who has crossed by this building couldn’t have ignored the density of stray dogs that increases around here, all thanks to Ratan Tata’s love for these cute furries. While these dogs would earlier lie around the porch and the guard room, they now have a fully equipped room to themselves with other services, reported Times Of India. 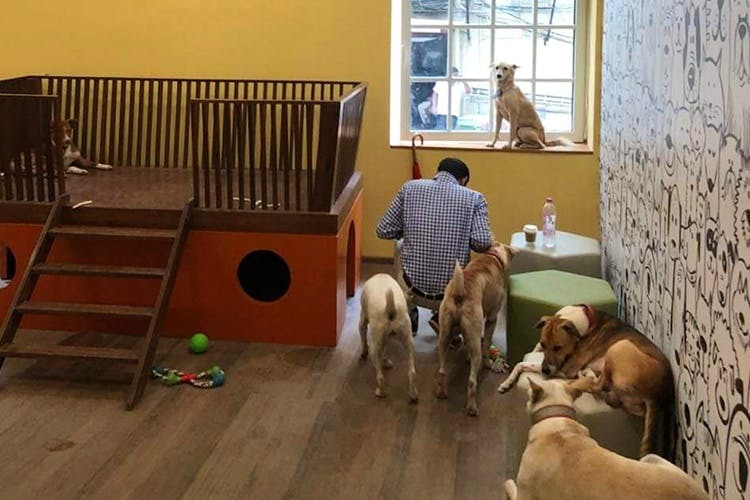 A kennel has been made on the ground floor, with facilities like a flap door for the dogs to go in and out at will, a bathing area, and a team of NGO doctors to cater to all their medical needs. The room has a yellow wall to brighten the area, plus another wall that has dog doodles all over it. The room is also well stocked with toys and chewies, and a regular supply of boiled meat that comes from the kitchens of Taj. The room also has a bed or some floor mats for the dogs to choose where they want to rest. And the big windows in the room make sure these friends get a fair share of sunlight and view. Currently, the room has eight dogs who have been around for a while. The guards, who obviously double up as pet parents, keep these animals pampered. And guess who they’re meeting quite often? The man himself, Ratan Tata who is occasionally seen petting these long residents of Bombay House.